The idea of buying meat in bulk may seem like an embarrassment of riches. After all, you’re just shopping for your family, not a restaurant. But, if you can make room in your budget and in your freezer, stocking up on restaurant-quality beef and chicken is a no-brainer. If you don’t have a few hundred in your back left pocket or wallet, take the time-honored method of saving up for what’s important. You can schedule your bulk purchase like any other large payment that you make throughout the year. You’re working with consistent numbers, unlike the yo-yoing prices at the grocery store which vary from week to month. If you’re concerned that the meat at the bottom of the freezer won’t taste as good as the meat at the top, according to the folks that set the standard for the safety of food in the U.S., the USDA Food Safety and Inspection Service, “If frozen at peak quality, thawed foods emerge tasting better than foods frozen near the end of their useful life.” Our meats are frozen at peak quality. 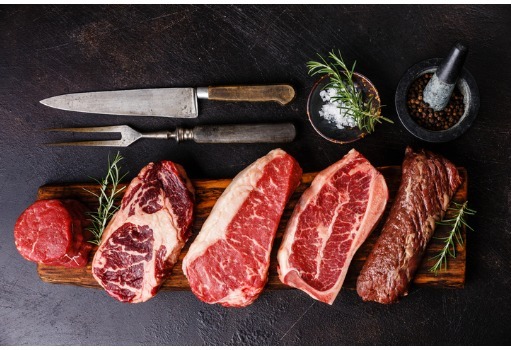 They also say: “In meat and poultry products, there is little change in nutrient value during freezer storage.” This is great news because, according to one study, grass-finished beef has more monounsaturated fatty acids, which may raise HDL, or “good”, cholesterol levels. You’re not losing out on valuable nutrients by having your meat frozen for months on end! Our meat goes from hoof to your freezer with minimal stops along the way. Since your order is shipped frozen, there’s less need to worry about bacteria build-up which could occur due to uneven refrigeration. Late summer/early fall is harvest time. Pre-ordering saves you time and allows you to better budget your resources. It allows you to pay a little now, and a little more later. And it gives you more time to clear out the freezer (a cubic foot will hold 30-40 pounds). So, forget about timing multiple meat shopping trips based on the weekly sales flyer in the months to come. If you like shopping at big-box stores, you already appreciate the time and money saved by buying in bulk. They have large meat packages. We have many large packages in an order. Theirs has to be separated and repacked for the freezer. Ours is freezer-ready. You save money there, you’ll save money at the Rafter W Ranch. If you’re not a big-box store shopper, simply consider the time and cost savings. Buying in bulk from the harvest source means stocking up on high-end restaurant-quality beef, chicken, and lamb for many happy meals in the months to come.